30 October 2018 Unlocked content from the archive. The Australia of Mallee Sky is a familiar one—wide, red-brown, drought-stricken, unforgiving, yet strikingly beautiful—but never a cliche. The book avoids patronising children, instead welcoming them into a mature literary and painterly conversation. Toering’s language is both lyrical and accessible; the narrative dips into first person, helping children connect to the descriptions of landscape, but largely rests in careful, poetic prose. Complementing the textual imagery of the broad, wide stillness of the drought-stricken region, Harricks’ oil paintings are sure, rich, and full of motion. Mallee Sky takes the drought in its stride, neither sentimentalising nor sterilising the devastating potential of the desert. While the book gently hints at climate change and the struggles of rural towns to survival, it is careful to end in tones of hope and positivity appropriate for a middle to upper-primary age group. 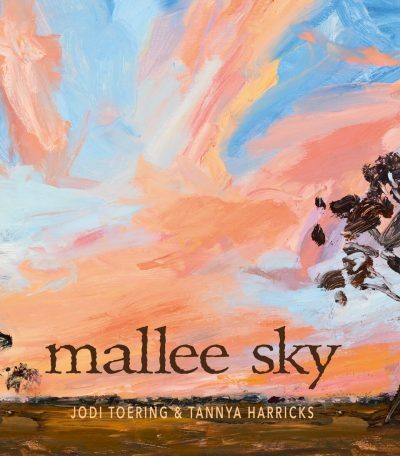 Mallee Sky would speak equally well to Australian and non-Australian children, and works on both a factual and storytelling level. Though it reads satisfyingly as a story in its own right, it would also make an excellent starting place for educational discussions with primary school readers about place, landscape, environment and climate change, as well as for creative exercises in both visual and linguistic modes, or indeed in combining the two.